When Margaret Conneely wrote these lines in an article called “Making a Movie: The Techniques of Shooting and Editing Films Outlined for Beginners,” she was voicing a manifesto for an entire generation of amateur movie-makers. At the same time, Conneely was at the pinnacle of her own amateur career, writing and directing three award-winning 16mm short films: Mister E (1959), The ’45 (1960) and Chicago: City to See in ’63 (1962). 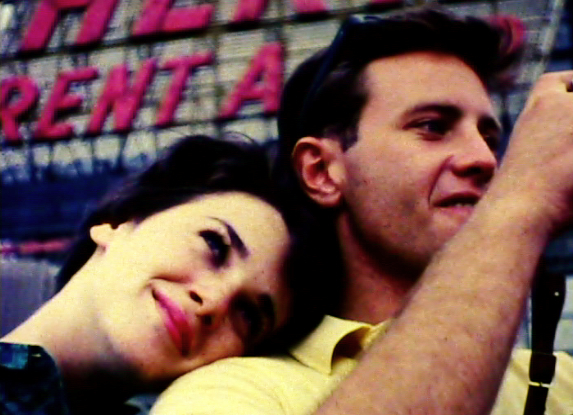 With help from the Women’s Film Preservation Fund and a collaboration with Colorlab in 2006, the Chicago Film Archives was able preserve these significant and unheralded amateur works. 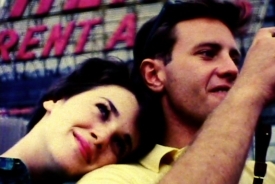 These three short films represent the peak of amateur film accomplishment in the late 1950s and early 60s. Conneely embeds her stories of seemingly normal domestic life with a light and innocent-looking strand of wicked and even sadistic humor, so amorphous and nuanced you often don’t know why you are squirming in your seat. A domestic “black comedy,” Mister E (1950s) expresses some of the edgier mischief and discontent that women of the 1950s could rarely express openly. This short film narrates the revenge acted out by a young wife, left at home while her husband is at a card game; by staging a rendezvous with a mannequin, this woman provokes an eruption of jealousy and violence before bringing about the desired marital tenderness. Similar in some respects is The ’45 (1961), perhaps playing out at an amateur level Jean-Luc Godard’s dictum that all a film needs for a plot is a woman and a gun. This is how Conneely says The ‘45 came about: with a prop and an actor. From these elements she crafted another mischievous and entertaining film, this one about a woman willing to employ any means to send away the man who comes looking for her husband with a gun, only to finally discover that the man was only returning the weapon. With her impressive technique, Conneely is able to make an unsettling and amusing critique of gender power-relations out of this simple story. A wife and mother with a career, Conneely was not afraid of using amateur film as a means of poking fun at the social conventions and roles that structured middle-class life. 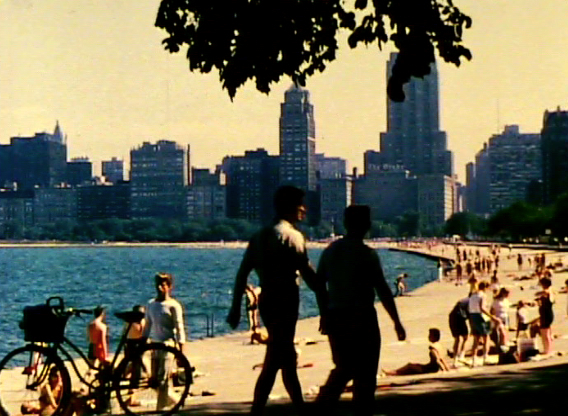 The third film, Chicago: City to See in ’63 (1962) is a slight departure from these darkly comic themes, though still maintains Conneely’s familiar technical skill and playful tone. A “city symphony” film, produced to encourage Photographic Society of America members to attend their 1963 conference in Chicago, City to See is a surprising film. 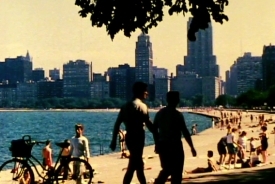 It edits together beautiful and dynamic footage of Chicago and then combines this with a deadpan commentary that pokes fun commercial travel films: “Chicago is my town,” the narrator says wryly, “and no other town will do.” Conneely was awarded a special prize by the Photographic Society of America for this film. These three films by Margaret Conneely, are remarkably entertaining and well-crafted films, as well as exemplary works of vernacular American filmmaking. The archival community has recently played a crucial role in brining amateur film history to light by preserving accomplished and playful works such as those by Sid Laverents. The mid-1950s marked the beginning of a new era for amateur filmmakers as the pioneering Amateur Cinema League dissolved and the Photographic Society of America’s Motion Picture Division became the world’s largest amateur organization. The preservation of Mister E, The ‘45 and Chicago: City to See in ’63 helps fill in an important piece of this historical narrative by providing excellent examples of award-winning, post-war amateur filmmaking. They also demonstrate the active participation in organized amateur filmmaking by women, illustrating the craftsmanship, subject-matter and inventiveness that characterized their work. 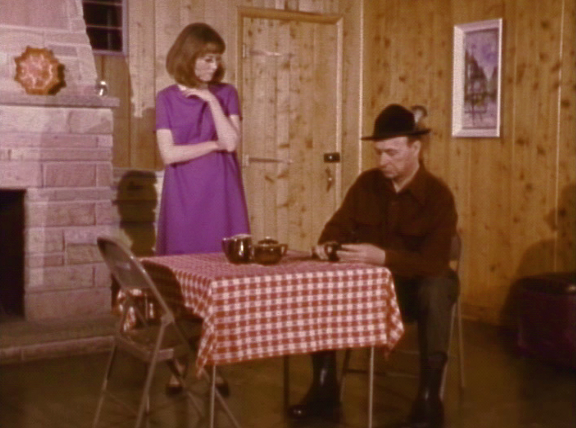 CFA also preserved a fourth film by Conneely, Fairy Princess (1956), with support from the National Film Preservation Foundation.